← Is It Time To Buy South Africa For A Trade? 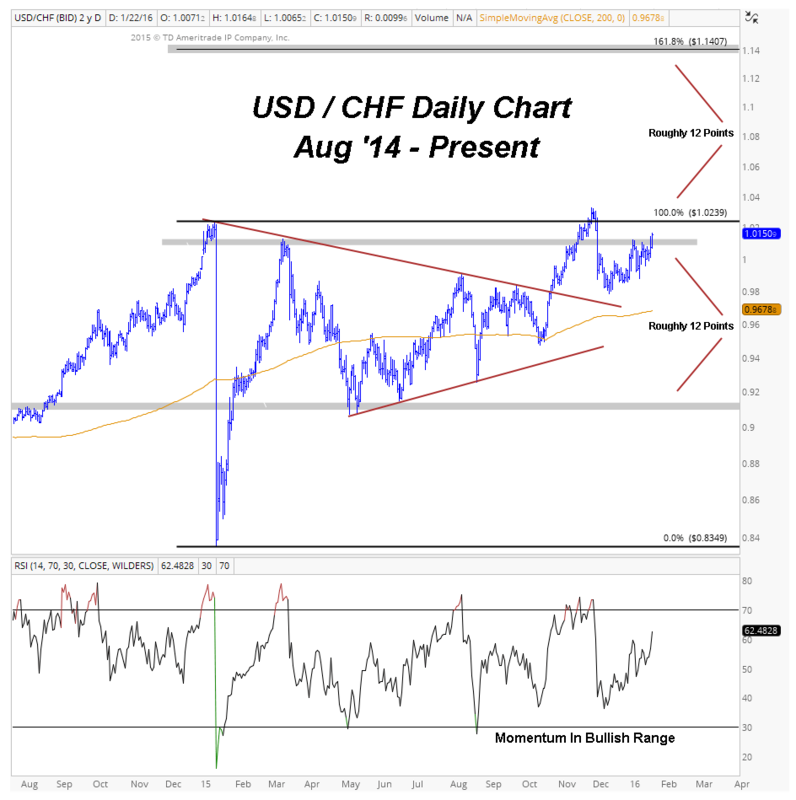 The daily chart provides a more tactical perspective, as well as a closer look at the consolidation at the upper end of the trading range that has taken place over the past year. With a rising 200 day moving average, momentum maintaining a bullish range, and prices breaking out of the top end of the range, the weight of evidence suggests higher prices are ahead. The main tactical target I’m looking at is near 1.14, though I don’t expect us to get there in a straight line by any means. This level represents the measured move target of the 2015 trading range, as well as the 161.8% extension of the January 2015 decline. Additionally, this target corresponds nicely with the structural targets discussed on the weekly chart. 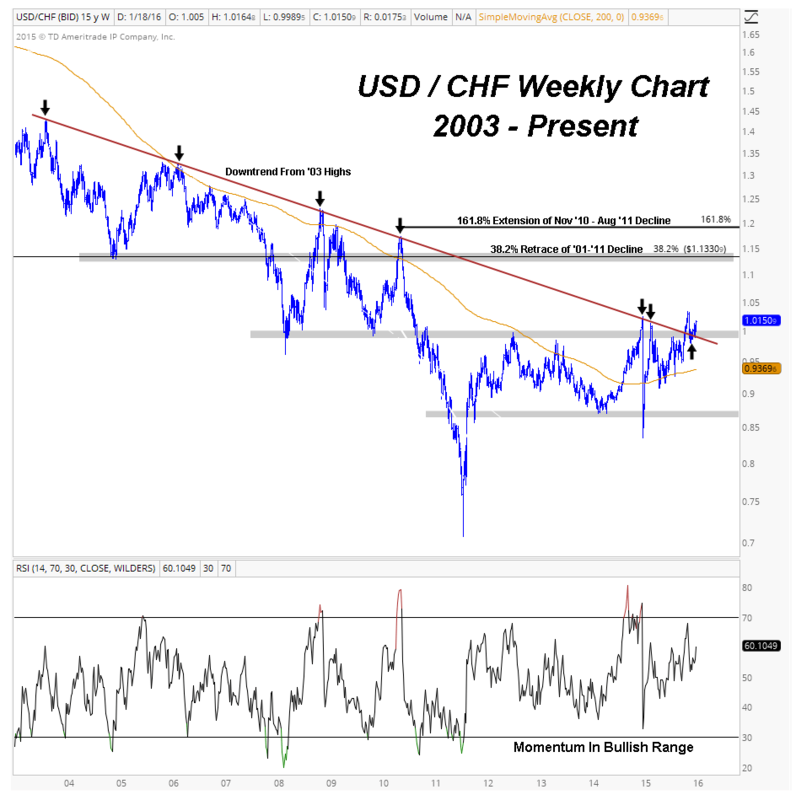 The Bottom Line: After a few long years of patience, the weight of evidence across multiple time-frames is finally suggesting that a sustainable structural breakout is underway in USD/CHF. The risk is very well-defined in that I only want to be involved in this market as long as prices are above the downtrend line from the 2003 highs, as well as the prior resistance level outlined in gray near 0.9850. From a more tactical perspective, longs want to see prices quickly accelerate to the upside after this week’s breakout above 1.01. As I said, there will be stops along the way, but I ultimately think that this market is headed 12% higher toward the structural and tactical price targets that converge around 1.13-1.14. JC here – I could not agree more with what Bruni is seeing here. What I would like to reiterate, however, is the risk vs reward that he is presenting. Remember, it is not about being right, it is only about making money. If we are consistently putting ourselves in a position where the risk vs reward is very much skewed in our favor, as is the case here, then we already have a huge advantage over every one else. Me personally? I like the March highs from last year just above 1.01. I would only be long this cross if we’re above that. This put the risk/reward very much in favor of the bulls. To me, that’s what matters most. This post originally appeared on AllStarCharts.com on 01/30/2016.